Relax after a long day with your feet up when you unwind with this handsome power reclining sectional in your entertainment room. Invite the neighborhood over for your killer super bowl parties with plenty of room for everyone to sit in plush style and enjoy. 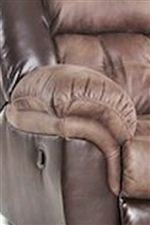 Plush arms work with the split seat and seat backs, and two tone fabric for a look you will love. Complete with a storage console and cup holders, this sectional is exactly what you have been searching for. The 139 Casual Power Sectional with Storage Console and Cup Holders by HomeStretch at Wilcox Furniture in the Corpus Christi, Kingsville, Calallen, Texas area. Product availability may vary. Contact us for the most current availability on this product. 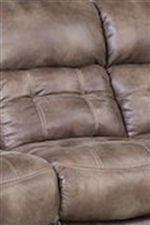 139-29-17 Reclining Power Loveseat 1 81" 41" 43"
139-39-17 Reclining Sofa 1 93" 41" 43"
139-04-17 Wedge 1 72" 41" 43"
The 139 collection is a great option if you are looking for Casual furniture in the Corpus Christi, Kingsville, Calallen, Texas area. Browse other items in the 139 collection from Wilcox Furniture in the Corpus Christi, Kingsville, Calallen, Texas area.